Valatine Lewin was good. Few knew of her, but those who did ensured she always had work. She had been Faceless many times before, smuggling Eldar trinkets, silver devices of unknown origin, and even fresh Ork teef from battles along the Stygies Cluster. The Faceless Trade never ended; the voracious appetite for the outré and forbidden meant that there would always be people like her to whet it. Fantasy Flight Games has announced Forgotten Gods, the first book-length adventure for Dark Heresy Second Edition ! A moment of unchecked heresy can damn millions of lives. Any Warhammer 40K fan knows that as fact. As an Acolyte of an Inquisitor, your job is to forestall this fate, holding off the eternal corruption of Chaos. You’ll investigate proscribed artifacts of deadly power and battle a cult whose heresies reach far into the Askellon sector’s past. Mankind was not always such a powerful force in the galaxy. Long before the first humans achieved consciousness, ancient gods ruled the stars and spaces between them. In Forgotten Gods, your fears are about to be realised. A cult has hired the smugglers of the Faceless Trade to bring them forbidden artifacts, and they plot to use the power of these artifacts to reawaken a god from the time before Man. As a devoted servant of the Emperor, you cannot allow this heresy to occur. Forgotten Gods is the first book-length adventure for Dark Heresy Second Edition, and shows off more of the Askellon Sector! 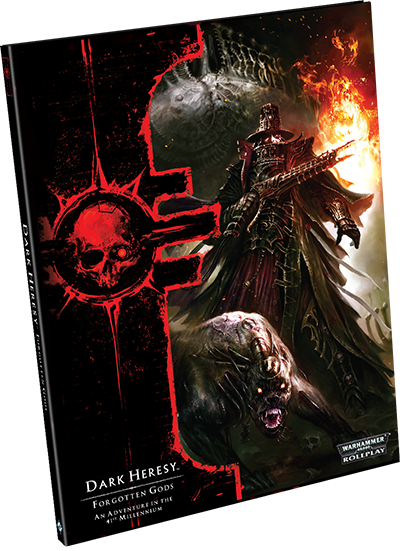 The adventure continues the storyline begun in the Dark Heresy Core Rulebook, where the Dark Pursuits adventure started your investigations into the dangerous xenos artifacts that pollute Hive Desoleum. You’ll be able to to continue developing your character if you’ve place the Dark Pursuits or Desolation of the Dead adventures, or you can play without have already experienced the previous adventures. Forgotten Gods also offers new options for Acolyte creation. Each of the three major locations explored in this book includes rules for using that location as an Acolyte’s home world, so new players can craft characters hailing from these vastly different parts of the Imperium. Alternatively, a player can use this information to create a new Acolyte should his existing character not survive their climatic adventures in Forgotten Gods!